Our beds are made to be your haven, whether snuggling up for a good night’s sleep, lounging all day or enjoying a well-deserved peaceful moment. 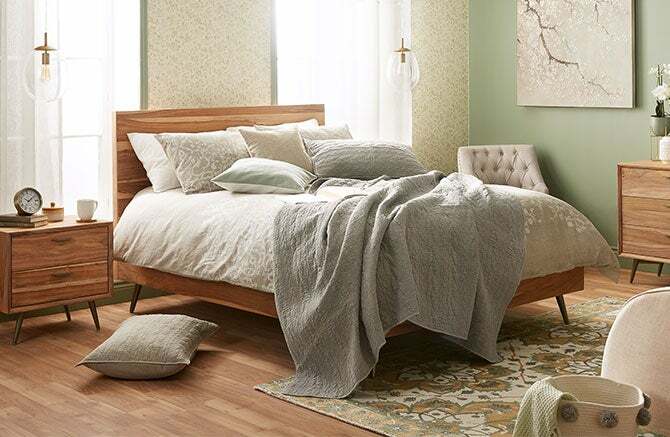 Our vast selection of bedroom furniture ranges from mid-century styles to rustic and modern designs. Made of natural wood, upholstered in luxurious fabric or coated in a super sleek lacquer, our products will help you create the space you’ve always dreamed of. Our pocket spring and memory foam mattresses will make you feel like you’re floating on the most supportive of clouds, while our soft bedding will keep you warm and cozy. Complete the look with handy nightstands and dressers - keeping all of your essentials within reach.